Published on Monday, January 21, 2013. This article appears in the February/March 2013 issue of American Craft Magazine. Some of the tools blacksmith Shawn Lovell has forged for her collection are traditional, others were created for a specific task; all have a beauty born of utility. When blacksmithing is depicted in popular culture, the image tends to be one of brute strength rather than finesse: A male of Wagnerian proportions wields a hammer overhead as veins bulge and sweat drops from his protuberant brow. At Shawn Lovell’s studio in Alameda, California, such clichés are shattered with each strike of her hammer. A lithe and wiry 49, Lovell demonstrates her technique for forging a leaf, in a sequence that resembles a tightly choreographed dance, moving from anvil to power hammer and back to the coal-fed flames in fluid, efficient movements. Even her ergonomic striking technique, developed by Israeli blacksmith Uri Hofi, is more contained than histrionic; it has spared her the repetitive stress injuries common to the trade. 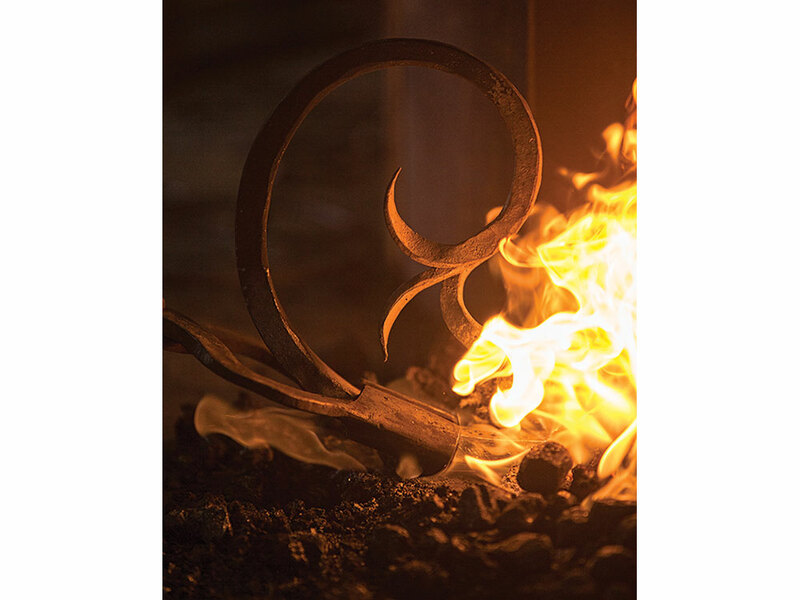 Lovell credits organizations such as the California Blacksmith Association with helping to revive what in the 1970s was a dying craft, in part by providing a kind of ongoing extension course – offering demonstrations, workshops, and, perhaps most important, community. She picked up Hofi’s singular striking technique, for example, from blacksmith Arnon Kart­mazov during a demonstration of Japanese knife making at a CBA conference in 2001. 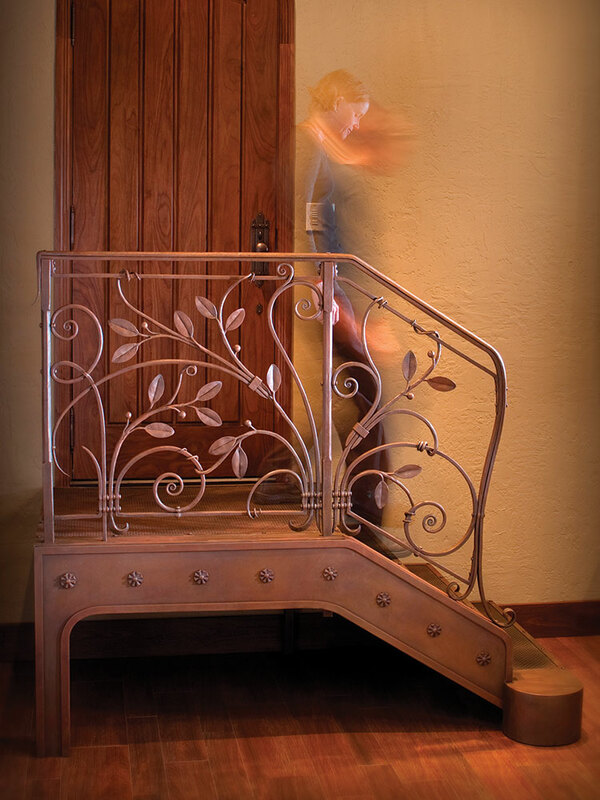 Lovell came to smithing via degrees in graphic design from Arizona State University and in sculpture, which she studied at the California College of Arts and Crafts, now CCA, in the early ’90s. “I loved ceramics, but clay doesn’t respond like hot metal. 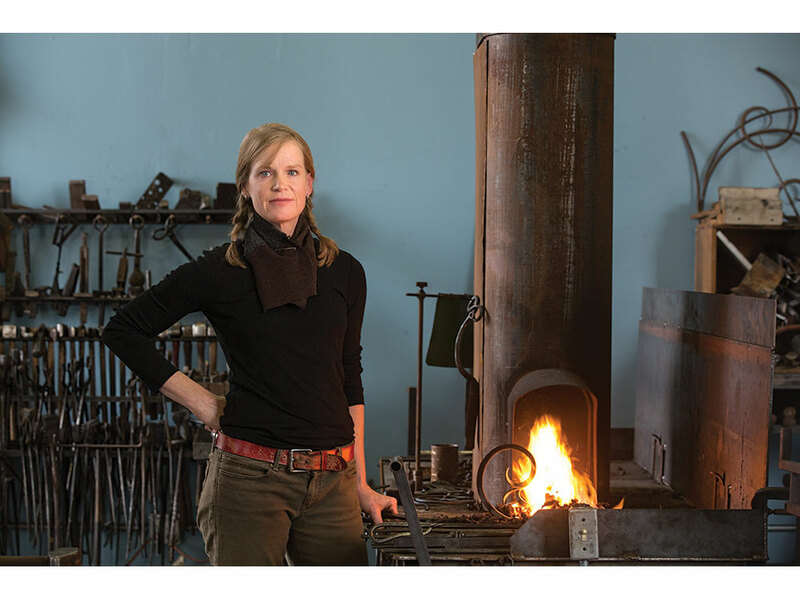 Steel talks back, it resists you ­­– it’s a dialogue.” A stint as a sculptor’s assistant introduced her to metal fabrication (in which metal is manipulated through cutting and welding); then, 15 years ago, a private commission drew her toward the fire. “My landlord, an avid gardener, asked me to create a bed as a gift for her husband,” Lovell says. The resulting Tree bed appears to have grown out of a fairy-tale forest, its four trunks crowned with leaves and spreading branches that cradle a bird’s nest. “Getting the design approved was the easy part. The terror came when I had to figure out how to actually make it,” recalls Lovell. Each trunk is wrought from four pieces of metal pipe in varying diameters. To create a subtle, lifelike effect rather than a series of unsightly dents, Lovell filled the sections with sand during forging. 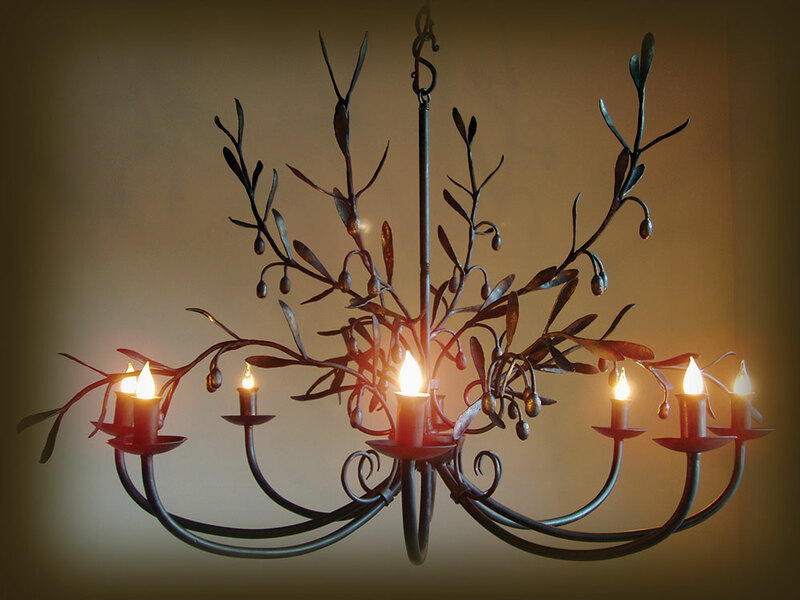 After welding the pieces together, she created the knots and forge-welded the individual leaves and branches. Over the years, the bed has become a signature piece. Images of it have swirled through the blogosphere, resulting in inquiries and commissions – a few of them high-profile (Gwyneth Paltrow’s daughter Apple lays her head on a white version) – along with instances of artistic plagiarism. One online retailer simply lifted an image of the bed off Lovell’s site and reworked it in Photoshop. Another chain, famous for its brand of boho whimsy, requested a sample, which Lovell does not keep on hand. 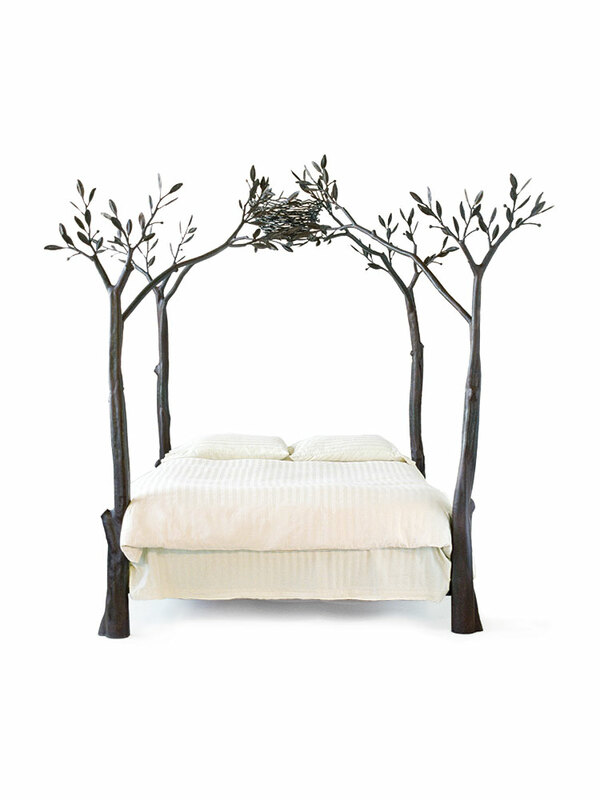 Soon thereafter, the “Forest Canopy Bed” ­–­ a seeming hybrid of the Tree bed and another Lovell creation called the Branch bed – appeared for sale. The portfolio on her website, which depicts not only beds but also custom furnishings such as fire screens, chandeliers, railings, and arbors, also attracted the First Congregational Church of San Francisco. In 2008 the church commissioned Lovell to design a set of sanctuary doors that would communicate its devotion to diversity. “When they mentioned the tree of life, I thought about the phrase from scripture, ‘I am the vine, you are the branches.’ I pictured a vine-entwined tree supporting different kinds of fruit, which I wanted to make from colored glass,” she says. “For years I’d heard that you can’t set glass into metal. They expand at different temperatures – the glass will shatter.” Lovell consulted the smithy’s bible, Alex Bealer’s The Art of Blacksmithing, which describes a process using bottle glass, then came upon the idea of heating glass rods (cane), more typically employed for beadmaking and lampworking. It worked. When the doors are closed, the backlit colored fruit glows among the branches and swirling tendrils, a modern spin on liturgical stained glass. She is gratified that municipalities and civic groups, famously cash-strapped, still recognize the value of the hand-wrought. Recently Lovell won a public commission to create entry gates for the Gardens at Lake Merritt in Oakland. Her design combines an abstract plant motif with a line of round, smooth rocks threaded onto the gate pickets below – an allusion to the soil line and a meeting ground between nature and art. A queen-sized Tree bed, made of forged and fabricated steel. Lovell introduced the design in 1997 and has made 20 of them to date. 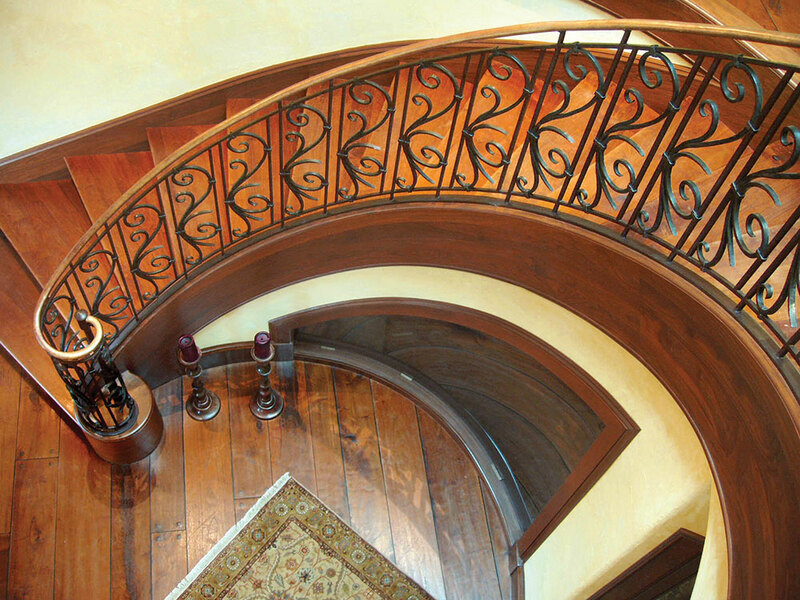 A Shawn Lovell residential staircase railing. 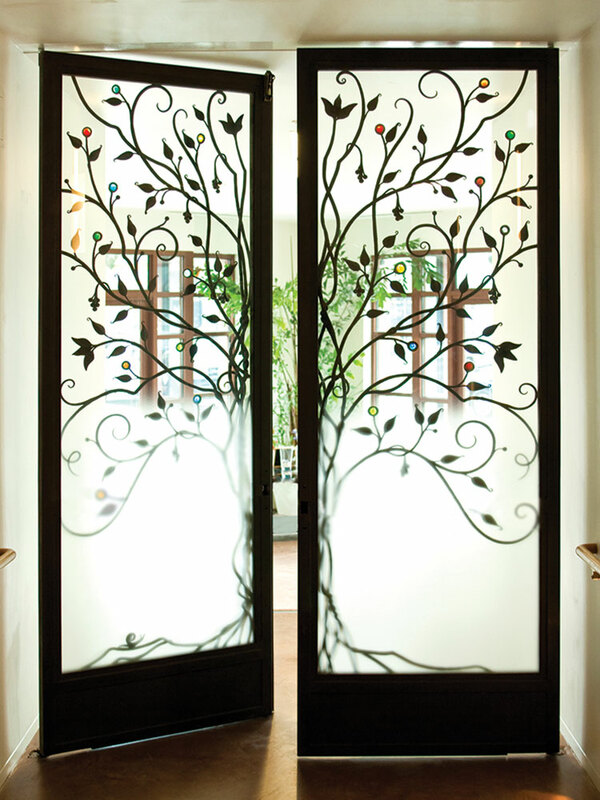 Shawn Lovell, First Congregational Church of San Francisco sanctuary doors, 2008, steel, fused glass, 9 x 6.25 x .25 ft.
A Shawn Lovell olive branch chandelier. 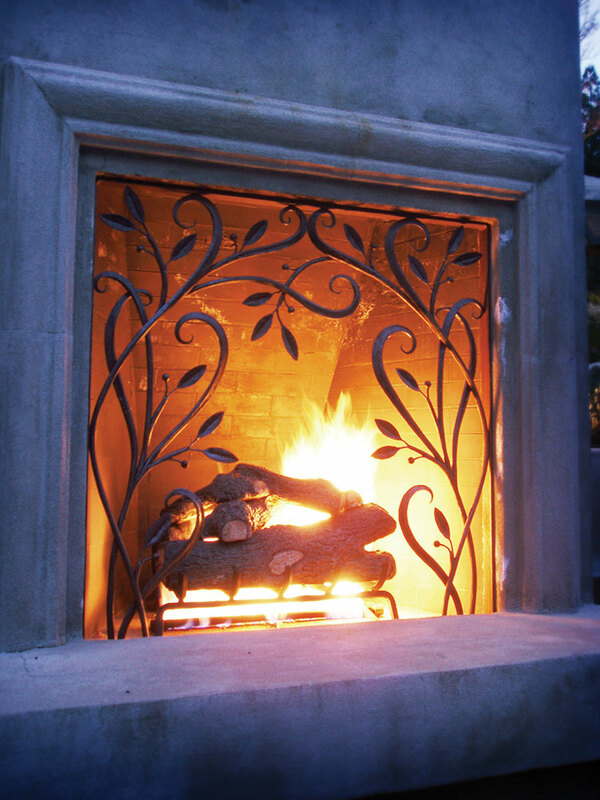 A Shawn Lovell fireplace surround. 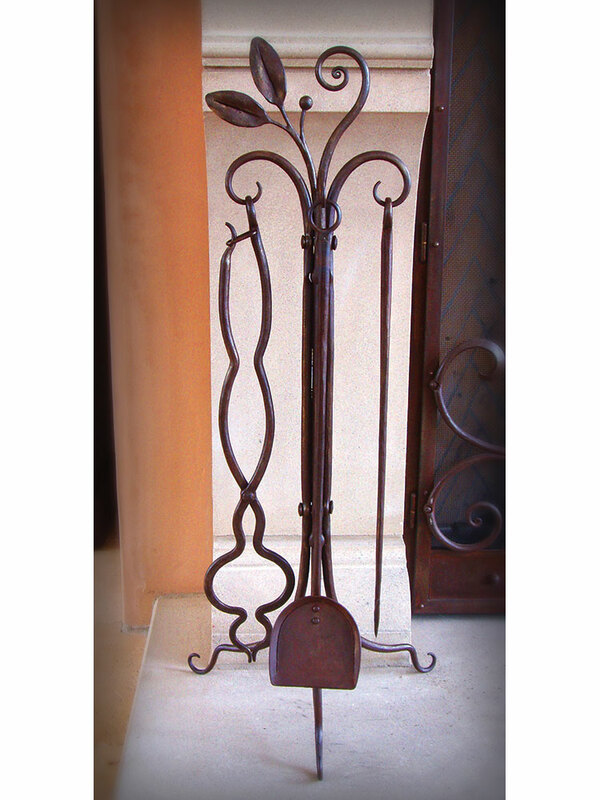 Shawn Lovell, Fireplace tools, 2010, forged steel, 23 x 10 x 10 in. 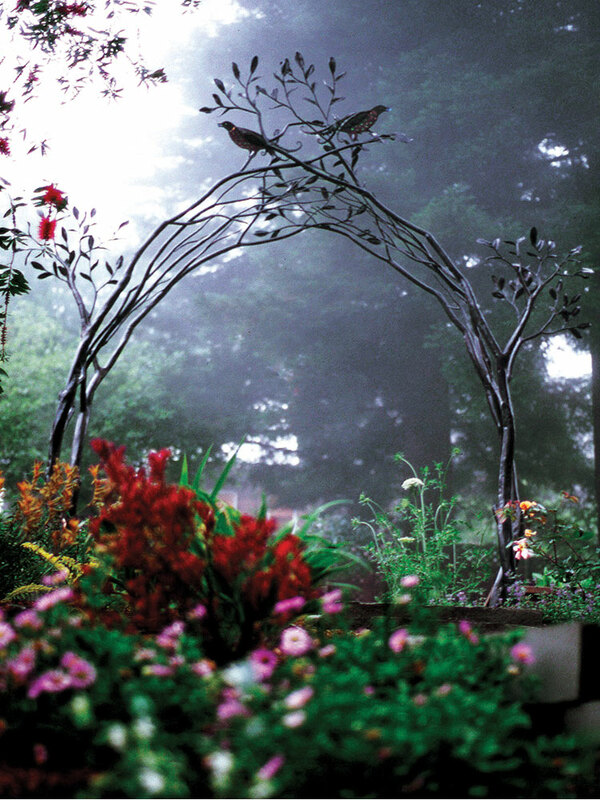 Lovell’s nature-inspired designs are equally elegant outside of the home. 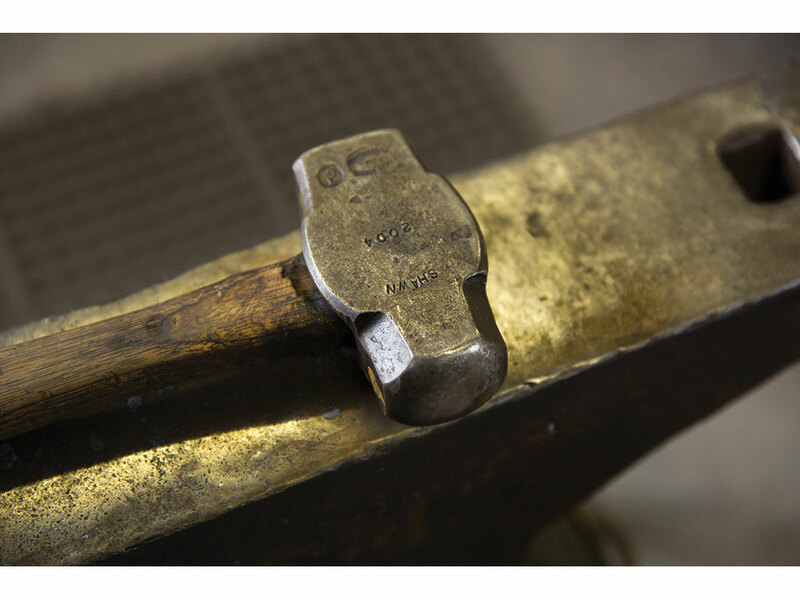 Once heated, steel becomes malleable and can be formed with a hammer and anvil. 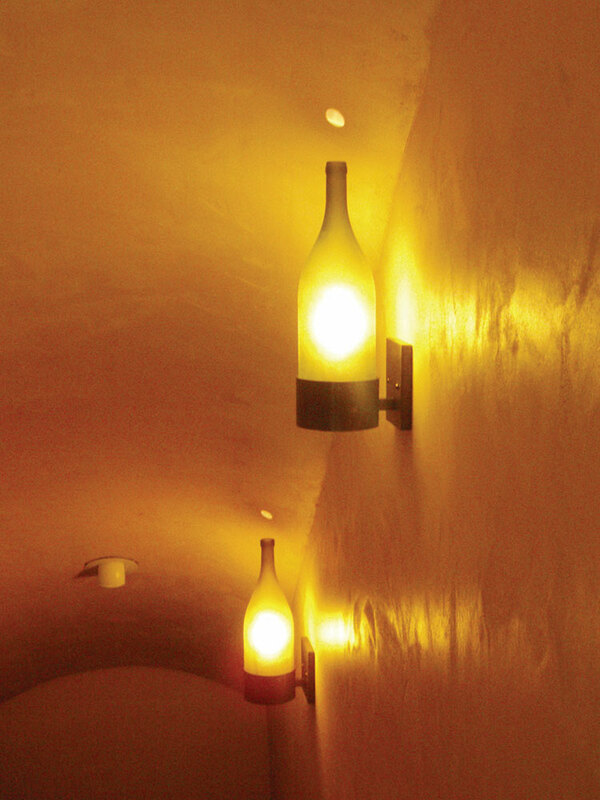 Shawn Lovell wine bottle sconces. 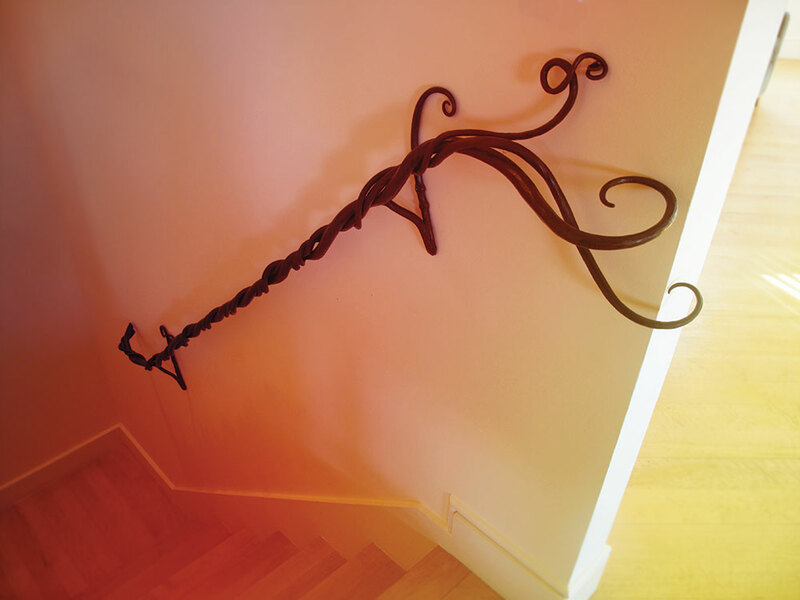 A Shawn Lovell wine cellar railing. A Shawn Lovell wisteria vine handrail. Blacksmith Erica Gordon creates chic buckles and lustrous dyed-leather belts.